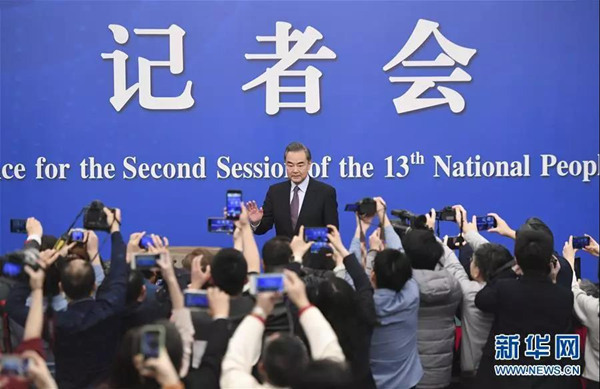 On 8 March 2019, the Second Session of the 13th National People's Congress (NPC) held a press conference, at which State Councilor and Foreign Minister Wang Yi answered questions from Chinese and foreign media about China’s foreign policy and external relations. Wang Yi: Friends from the media, good morning. It’s my great pleasure to host this annual press conference again on the margins of the National People’s Congress Session. As always, let me begin by extending festive greetings to all women, including those in this room. Looking back at the past year, we in China’s diplomatic service, under the strong leadership of the Communist Party of China (CPC) Central Committee with Comrade Xi Jinping at its core, navigated the complex international currents, forged ahead with a clear sense of purpose, and made new and important strides. Today I will try to give you a full picture of China’s foreign policy and do my best to improve understanding between China and the rest of the world. Now I’d be happy to take your questions. People’s Daily: The year 2019 marks 70 years since the founding of the People’s Republic of China (PRC). What are the most important achievements and experience of China’s diplomacy in these seven decades? How do they inform what you’re doing today? Wang Yi: Indeed, 2019 marks 70 years since the founding of the PRC. Under the strong and correct leadership of the CPC, our people have forged ahead as one in the last 70 years and made great strides that have truly impressed the world. On the diplomatic front as well, we have broken new ground, overcome many difficulties and traveled an extraordinary journey. As General Secretary Xi Jinping has rightly stated, China is ever closer to the world’s center stage. Our diplomatic accomplishments are due, first and foremost, to the leadership of the Party, which is the fundamental political guarantee for China’s diplomacy. For seven decades, the Party has advanced with the times, developed a rich body of diplomatic theories with Chinese characteristics and established a fine tradition with distinctive features. They include: independence as a cornerstone of China’s foreign policy, concern for the common good of humanity, pursuit of equity and justice, commitment to win-win outcomes, the mission of facilitating domestic development, and dedication to serving the Chinese people. At last year’s Central Conference on Work Relating to Foreign Affairs, Xi Jinping Thought on Diplomacy was established as our guideline, an epoch-making milestone in the development of New China’s diplomatic theories. It sets the fundamental course for our diplomacy in the new era and points the way for navigating through the complex array of issues in today’s world. The world is experiencing profound shifts unseen in a century. Chinese diplomacy has reached a new starting point. Led by the CPC Central Committee with Comrade Xi Jinping at its core, we will fully implement Xi Jinping Thought on Diplomacy, uphold our founding principles and keep our mission firmly in mind. We will remain committed to the path of peaceful development, work for win-win outcomes, uphold the existing international system and shoulder more international responsibilities. We will both strive to create a better environment for China’s rejuvenation and make new and greater contributions to world peace and human progress. Yonhap News Agency: The second DPRK-US summit did not produce any agreement, making the situation on the Korean Peninsula more complicated and unpredictable. What will China do this year to facilitate denuclearization and the establishment of a peace regime on the peninsula? 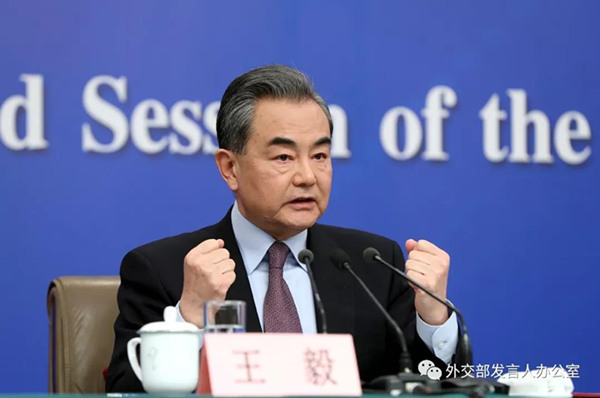 Wang Yi: The Hanoi summit was an important step toward a political settlement of the nuclear issue on the Korean Peninsula. The fact that DPRK and US leaders overcame obstacles to meet again for a candid, face-to-face discussion itself represents a positive development that must be applauded. The international community should encourage both sides to have patience and keep moving toward the goal of denuclearizing the peninsula and establishing a peace regime. If the parties continue their dialogue and stay the course, the day will come when the denuclearization of the peninsula will become a reality. Of course, as the nuclear issue has dragged on for decades and complicated factors are at play, one cannot expect it to be solved overnight. All parties need to have reasonable expectations. One shouldn’t set the bar too high at the outset or make unilateral, unrealistic demands. The key to solving the issue lies in not being a prisoner of history and breaking the cycle of mistrust. As we see it, it would be useful to jointly work out a general roadmap for denuclearization and the establishment of a peace regime. Based on the roadmap and in a phased and synchronized fashion, we may identify specific, interlinked and mutually reinforcing steps, which will be taken in sequence, starting with the easier ones, and monitored in a way agreed to by the parties. China’s position on the issue has been consistent. We are committed to achieving the denuclearization of the peninsula, to solving the issue through dialogue and to maintaining peace and stability on the peninsula. We have been working for these goals for over 20 years and our role has been irreplaceable. China will, along with the other parties, continue to contribute to meeting these goals. China Arab TV: China will host the second Belt and Road Forum for International Cooperation this year. Can you give us an indication of how many foreign leaders are going to attend and what China hopes the forum will achieve? Wang Yi: The much-anticipated second Belt and Road Forum for International Cooperation (BRF) will be held in Beijing in late April. It’s the most important diplomatic event China will host this year and an international gathering that will capture the world’s attention. President Xi will give a keynote address at the opening ceremony and chair a leaders’ roundtable. There will also be a high-level meeting, thematic forums and a CEO conference. The second BRF has three things to watch for: First, the number of foreign heads of state and government expected to attend will be much larger than that of the first BRF. Second, it will be a much bigger gathering with thousands of delegates from over 100 countries. Third, there will be more side events including 12 thematic forums focusing on practical cooperation and, for the first time, a conference organized specifically for the business community. With the theme of “Belt and Road Cooperation: Shaping a Brighter Shared Future”, the second BRF aims to bring about high-quality cooperation under the Belt and Road Initiative (BRI). China looks forward to a full exchange of views on future cooperation plans. China will build consensus with the parties on high-quality development, follow the principle of consultation and cooperation for shared benefits, champion an open, transparent and inclusive approach to BRI cooperation, and strive for green and sustainable development. China and the participating countries will seek greater complementarity between the BRI and their development strategies, agree on a line-up of key cooperation projects, promote the implementation of the UN 2030 Agenda for Sustainable Development and pay more attention to improving the lives of the ordinary people as we deepen our cooperation. China will act in the spirit of win-win, focus on improving physical connectivity, build a stronger momentum for common development and forge an even closer partnership. China will champion open and inclusive cooperation, support economic globalization, uphold multilateralism and work with all to make the world economy an open one. As President Xi has said, the BRI originates in China, but its benefits are shared by the world. We have reason to hope and believe that the second BRF will be a great success and another milestone in BRI cooperation. Phoenix Television: We’re following Ms. Meng Wanzhou’s case very closely. Many commentators say that Washington is clearly trying to take down a Chinese high-tech giant. What’s your take? Wang Yi: It’s quite obvious to any fair and unbiased person that the recent action against a particular Chinese company and individual is by no means a pure judicial case, but a deliberate political move to bring them down. China has and will continue to take all necessary measures to resolutely protect the legitimate and lawful interests of Chinese businesses and citizens. This is the bounden duty of the Chinese government. At the same time, we support the company and individual in question in seeking legal redress to protect their own interests and refusing to be victimized like “silent lambs”. People can tell right and wrong, and justice will have its day. What we’re standing up for is not just the interests of a company, but also a country or a nation’s legitimate right to development – and, by extension, the basic right of all countries who wish to climb up the technology ladder. We hope all parties will follow rules, overcome prejudice, create a level playing field for the businesses of all countries, and provide a safe and reliable environment for the interactions of people of all nationalities. ANSA: Both the EU and China are strong supporters of multilateralism and free trade. In the meantime, the two sides do not see eye to eye on everything. In your opinion, how can the two sides strengthen diplomatic relations and mutual trust? Wang Yi: Europe is always an important priority on China’s diplomatic agenda. China supports European integration and a united and strong EU. Later this month, President Xi will visit Europe on his first overseas trip this year, which speaks volumes about China’s support for Europe. Overall, China-Europe relations are in good shape. There are far more areas where we agree than disagree. In a world full of uncertainties, China and Europe both stand for multilateralism and against unilateralism and protectionism. We have common views and concerns on these important issues. On the other hand, our relationship is not insulated from external interference and distraction. China hopes to have more dialogue with Europe to properly handle and manage the situation. Europe has always prided itself on its independence. We trust that as a key force in the world, Europe will surely keep its fundamental, long-term interests in mind and pursue a China policy that is independent, consistent and forward-leaning. We hope Europe will work with China to deepen all areas of our mutually beneficial cooperation, uphold international rules and contribute to global peace. China Central Television: This year marks the 40th anniversary of diplomatic relations between China and the US. It is said that “at 40, one should have no more doubts”. Do you think the two countries have reached that place? How would you characterize the relationship as it stands today? Wang Yi: The 40th anniversary is an important opportunity to review the past and plan for the future. The China-US relationship has gone through a lot in the last 40 years. We have made historic progress, but also face new challenges. The most important thing we can learn from the past is that China and America stand to gain from cooperation and lose from confrontation. Although a great deal has changed in the world and in both countries, this valuable lesson still holds true today and must continue to guide our interactions. We must stay the course without any doubts. We have a clear sense on our future path: the two countries will work together to build a relationship based on coordination, cooperation and stability. This is an important understanding reached by our presidents. It should be what unites both nations and what the two sides work together to accomplish. Even as China and America engage in cooperation, there may also be some competition. This is normal in international relations. The key is to put things in perspective. Exaggerating our competition out of all proportion would squeeze our space of cooperation. The right attitude is to focus on expanding our cooperation. This is both in our mutual interests and what we owe to the world. We hope the US will reject its zero-sum approach, pursue shared goals with China, foster healthy competition while deepening our cooperation, and strive for win-win outcomes as we seek our own countries’ development. RIA Novosti: China and Russia are celebrating 70 years of our diplomatic relations this year. What are the highlights of our bilateral relations and cooperation? Some countries see the close ties between Moscow and Beijing as a threat. How do you respond to this allegation? 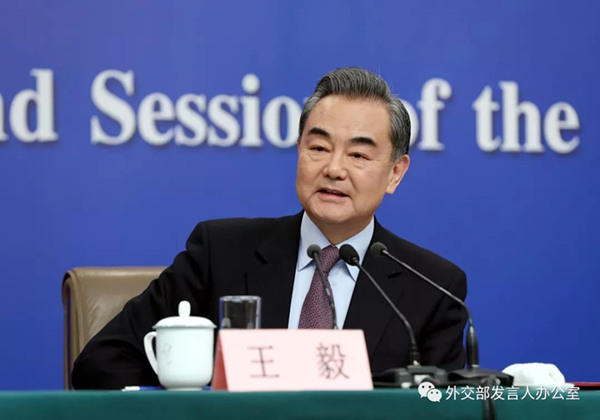 Wang Yi: Indeed, China and Russia will mark the 70th anniversary of our diplomatic relations this year. Our relationship has traveled an extraordinary course and, emerging from trials and tribulations, it has become more steady and mature. Our two countries have found a way of getting along. Marked by deep political trust, win-win economic cooperation and mutual support in the international arena, our relationship is held up as a good example of how major countries should interact with one another. A strong Sino-Russian relationship both delivers huge benefits to our two peoples and contributes significantly to peace and stability in our region and globally. In this important anniversary year, China and Russia will take our comprehensive strategic partnership of coordination to a new level. In terms of high-level engagement, President Vladimir Putin will attend the second BRF at President Xi Jinping’s invitation, and President Xi intends to pay a state visit to Russia at President Putin’s invitation. Guided by our presidents, the relationship will stride into a new era. In terms of win-win cooperation, our two-way trade passed the US$100 billion mark last year. This year will be one of harvest, notably the completion of three major projects. The eastern route of the China-Russia natural gas pipeline, known as “a project of the century”, will be operational within the year. Our first cross-border highway bridge through Heihe will be opened to traffic, and our first railway bridge through Tongjiang will be completed. China and Russia will also seek greater complementarity between the BRI and the Eurasian Economic Union to strengthen the internal drivers of our practical cooperation. While consolidating traditional areas of cooperation such as energy, we will explore new areas such as high technology, agriculture, e-commerce and financial services. Upgraded Sino-Russian cooperation will better enable our countries’ development and deliver greater benefits to our two peoples. In the area of international affairs, China and Russia shoulder important responsibility and mission as major countries in the world and permanent members of the UN Security Council. Our two countries are in constant communication on almost all the major issues and we invariably have common or similar views. In the year ahead, we will strengthen strategic coordination, and firmly uphold the purposes and principles of the UN Charter and global strategic security. When China and Russia stand together, the world will be a safer and more peaceful and stable place. Xinhua News Agency: At a time when international cooperation is buffeted by protectionism and unilateralism, China is increasingly seen as a champion of multilateralism and international cooperation. What will China do to uphold multilateralism? Wang Yi: In the last few years, unilateralism and protectionism has reared its head and returned with a vengeance. The good news is that more and more countries are stepping forward to resist and oppose this disturbing trend. There’s a growing realization that in the age of globalization, all countries share the same destiny – we rise and fall together. Therefore, instead of each going his own way, we should act as a team; instead of each minding his own business, we should help each other as passengers in the same boat. Championing multilateralism is the overwhelming consensus of the international community. China sees multilateralism as a cornerstone of the existing international order. The practice of multilateralism will, over time, make international relations more democratic and our world a more multi-polar one. China will carry the banner of building a community with a shared future for mankind, continue to stand on the right side of history and support the common interests of the majority of countries. China will work with all nations under the principle of multilateralism to resolutely uphold the international system centered on the UN and the international order underpinned by international law. Reuters: There is deep and growing suspicion in the US about China. Do you believe that China and the US are inevitably headed toward confrontation? How do you resolve that? Wang Yi: Cooperation and rifts have always existed alongside each other in China-US relations, but cooperation has always outweighed frictions. The recent period has indeed seen more problems and rifts in the relationship, but a historical perspective would reveal that what we’re witnessing is contrary to the long arc of our relations. We still have a positive outlook on China-US relations and trust that this view is shared by people in both countries. China and America should not and will not descend into confrontation. A return to the outdated Cold War thinking goes against the current trend, is deeply unpopular and has no future. The interests of China and America are already inseparable. Last year, two-way trade exceeded US$630 billion, the stock of mutual investment topped US$240 billion and visits in both directions surpassed five million. Almost all major US corporations have business in China and all American states are engaged in cooperation with China. Some individuals vow to decouple our economies. This is just their wishful thinking. Decoupling from China would mean decoupling from opportunities, from the future and, in a sense, even from the world. Cooperation is still the mainstream of China-US ties. Chinese and American leaders both agree to this description and it is supported by people of foresight in both societies. Our ongoing economic and trade consultations have made substantial progress, to the applause of both sides and the wider world. It shows that through consultation grounded in mutual respect and equality, there is no problem between our two countries that cannot be solved in a mutually satisfactory fashion. China Daily: There has been some skepticism and criticism about the BRI, which is described as a “debt trap” or “geopolitical tool”. What’s your response to these allegations? Wang Yi: Six years since it was proposed, the BRI has become the largest platform for international cooperation and the most welcomed global public good. To date, 123 countries and 29 international organizations have signed BRI agreements with China. They have cast a vote of support and confidence in the BRI. 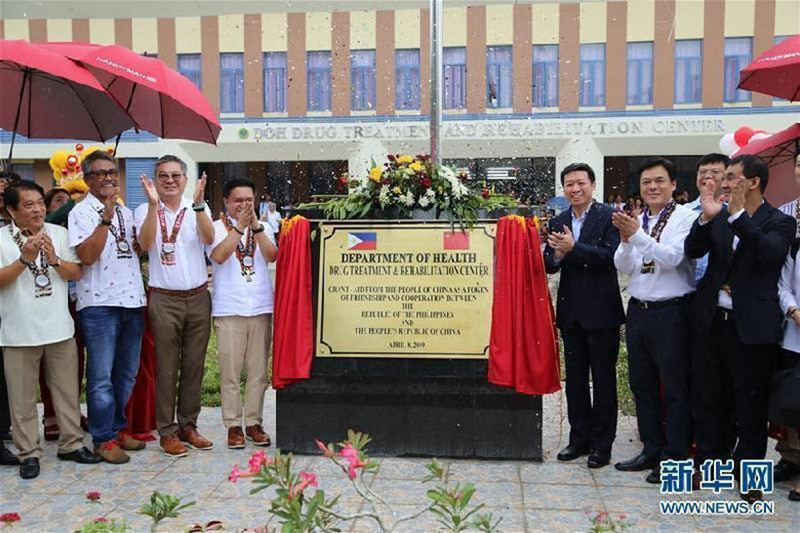 From the start, the BRI follows the sound principle of consultation and cooperation for shared benefits. It has created enormous opportunities for all participants. 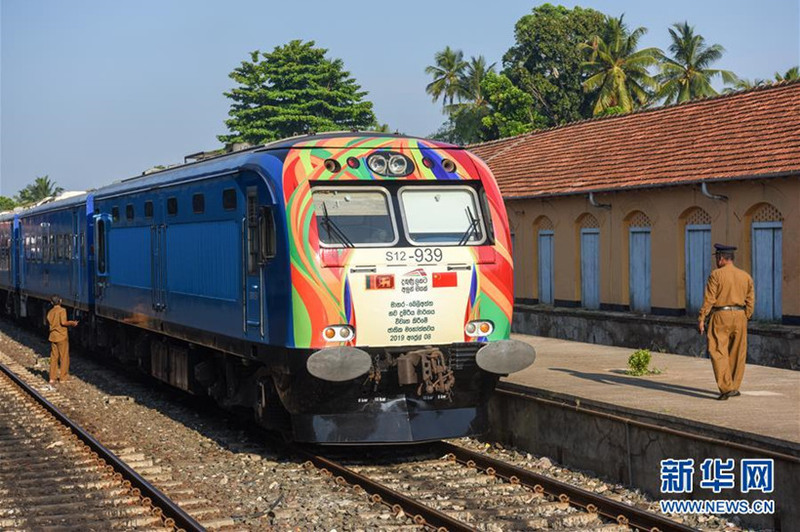 Thanks to the BRI, East Africa now has its first motorway, the Maldives has built its first inter-island bridge, Belarus is able to produce passenger vehicles, Kazakhstan is connected to the sea, Southeast Asia is constructing a high-speed railway, and the Eurasian continent is benefiting from the longest-distance freight train service. In Kenya, the Mombasa-Nairobi Railway, built with Chinese assistance and dubbed “a project of the century”, has created nearly 50,000 local jobs and boosted Kenya’s economic growth by 1.5 percentage points. In Uzbekistan, Chinese construction workers in collaboration with the locals have, in just 900 days, built a 19-kilometer railway tunnel through high mountains, cutting travel time to only 900 seconds. Plenty of facts like these are proof that the BRI is not a “debt trap” that some countries may fall into, but an “economic pie” that benefits the local population; it is no “geopolitical tool”, but a great opportunity for shared development. Signing up for the BRI has enabled countries to grow at a faster pace, improve their people’s lives and reap win-win outcomes. Of course, all new initiatives need time to mature. We welcome constructive suggestions from our BRI partners to fully reflect the principle of consultation and cooperation for shared benefits. I’m convinced that with everyone pitching in, the BRI will reinvigorate the ancient Silk Road in the new era and be a great help to nations and countries who are joining together to build a community with a shared future for mankind. Ghana Broadcasting Corporation: Many African countries seem to have increasingly recognized China’s development model and become more active in the BRI, much more than countries in the West. Now what are China’s ideas for further developing Sino-African relations? Wang Yi: China and Africa have a long-standing friendship. We are good brothers whose destinies and fortunes are entwined. China’s relationship with Africa is at the best it has ever been. China-Africa cooperation continues to be a pace-setter for the rest of the world. After decades of diligent nurturing, the sapling of China-Africa cooperation has grown into a towering tree that no force can topple. Going forward, we will fully implement the eight major initiatives announced at last year’s FOCAC Beijing Summit and continuously deepen our BRI cooperation. Seizing these two opportunities, we can build an even stronger China-Africa community with a shared future. China-Africa cooperation is becoming more and more successful, and this brings some criticisms and smears. But there’s deep mutual trust between our two sides, our friendship is time-tested and the fruits of our cooperation can be seen across the African continent. You may have noticed that some African leaders and individuals have come out against the ludicrous claim that China is setting up a “debt trap” or acting like a “neo-colonial power”. It shows that such slanders have no audience in Africa. China-Africa cooperation has always been open and inclusive. Africa’s development requires more input from the international community. The exemplary effect of China-Africa cooperation can be leveraged to encourage more countries to give greater attention, weight and input to Africa. When all of us combine our strength, we can contribute more to peace and development in Africa. Associated Press of Pakistan: The relations between India and Pakistan have become tense following recent escalations. This situation could endanger peace and stability in South Asia. As a neighbor and an important country, what is China’s position on this issue? Wang Yi: The recent events have refocused international attention on Pakistan-India relations. China has stressed from the beginning the need to exercise calm and restraint, prevent escalations, find out what has happened and resolve the matter through dialogue. In the meantime, the countries’ sovereignty and territorial integrity should be fully respected. China has followed these principles in its mediation efforts and played a constructive role in defusing the tension. In the last couple of days, both Pakistan and India have indicated a desire to de-escalate the situation and start talks. We welcome this. Pakistan and India are neighbors that will always live with each other. They are both heirs to a millennia-old civilization on the South Asian subcontinent. Both countries face important opportunities to realize stability, development and prosperity. China hopes the two countries will get along, help each other and progress together. We sincerely hope that Pakistan and India will transform the crisis into an opportunity and meet each other halfway. We advise both parties to quickly turn this page and seek a fundamental, long-term improvement in their relations. When confrontation gives way to dialogue and disagreements are settled by goodwill, they can create a better future through cooperation. TASS: Last year the US government made a decision to pull its troops out of Afghanistan. There is a lot of international attention on the peace and reconciliation process there. Will China step in to fill the vacuum left by the US? Wang Yi: Afghanistan is at a critical moment. We see both the potential dawn of peace and a buildup of risks and challenges. Pursuing peace requires more courage than stoking conflict. We appeal to all parties in Afghanistan to set store by the greater good of their country and people, seize the major opportunity for political reconciliation, settle differences through dialogue, beat swords into plowshares and join hands to push open the door to peace. We call on the international community to give firm support for the Afghan-led, Afghan-owned reconciliation process, play a constructive role from the sidelines and build a momentum for dialogue. There is no vacuum in Afghanistan that needs to be filled, because the land belongs to the Afghan people. This year marks the centenary of Afghanistan’s independence. China ardently hopes that this country, after suffering so much, will have a rebirth, take destiny into its own hands from now on, and enjoy genuine independence and lasting peace. Afghanistan should not again become an arena of great-power rivalry, nor should it be subject to incessant conflict and mayhem. As Afghanistan’s neighbor and friend, China will, respecting the Afghan people’s wish and needs, continue to do its best for reconciliation and reconstruction in Afghanistan. Global Times: How does China view the situation in Venezuela? Washington has reacted strongly to several Latin American countries’ decision to establish diplomatic ties with China. Against this backdrop, how will China approach its ties with Latin America? Firstly, the sovereignty and independence of Latin American countries must be respected. This is a basic norm in international law. It’s up to the people of a country to decide its internal affairs. External interference and sanctions will only aggravate tension and bring back the law of the jungle. There have been plenty of such lessons in history and they shouldn’t be repeated. The sovereignty and independence of every country is precious, and must be cherished and preserved in equal measure. China will continue to support the search for a political solution in Venezuela through dialogue between the government and the opposition so as to keep the country stable and the people safe. Secondly, Latin American countries’ right to develop relations with China must be respected. The one-China principle is a widely recognized norm of international relations and an understanding accepted and acted upon by an overwhelming majority of countries. The decision by Latin American countries to establish and grow relations with China on the basis of the one-China principle accords with the trend of history and our times. It’s a correct choice that serves their fundamental and long-term interests. Such a choice shouldn’t be interfered with or criticized. Recent years have seen significant advancement of China-Latin America ties. Our cooperation, which is part of South-South cooperation, is grounded in equality and mutual benefit. It does not target other parties or try to “move other people’s cheese”. In the year ahead, China will deepen its engagement with Latin American countries through the China-CELAC Forum, the BRI and other mechanisms so as to usher our comprehensive cooperative partnership into a new phase. Bloomberg: Last year Chinese diplomats had rows with their host government in Canada, Sweden, et cetera. Why have they become so assertive? Wang Yi: Assertiveness has never been part of the Chinese tradition, and hegemony will never be our choice even when we become stronger. Yet like all countries, China will protect its lawful and legitimate interests and will not allow any infringement of its sovereignty and dignity. Whenever such things are at stake, Chinese diplomats, wherever they are in the world, will state China's firm position. As a civilization that has run uninterrupted for 5,000 years, China may be said to be the world’s most consistent and predictable country. China’s preference and goal have always been to interact with other civilizations on the basis of mutual respect, live in peace with all countries and pursue win-win results with the rest of the world. China will surely become stronger, but will not be assertive. China values its independence, but will not go it alone. China will stand up for its rights, but will not seek hegemony. Now and in the future, China will always reach fair conclusions on the merits of each matter and act within the bounds of international law. The Paper: Over the past year, President Xi Jinping and Chairman Kim Jong-un had four meetings and opened a new chapter in China-DPRK relations. What is China’s expectation for the relationship? Wang Yi: General Secretary Xi and Chairman Kim have had four meetings in less than a year, a record-setting pace of interactions in the 70-year history of China-DPRK ties. Under the joint guidance and push of our top leaders, our traditional friendship is brimming with vitality and our relationship is turning a new chapter. China-DPRK traditional friendship was forged and nurtured by the older generations of our leaders. It’s a valuable asset shared by both sides which should not and will not be affected by any temporary incident. The 70th anniversary of our diplomatic ties is a great opportunity to build on this strong legacy and take it forward. It is in our shared interests to cement and develop our long-standing friendship, and China is determined to do so. China fully supports the DPRK in exploring a development path that suits itself and making continuous progress in socialist construction, in implementing a new national strategy and focusing more on economic growth and better livelihoods, and in keeping to the goal of denuclearization and having its legitimate concerns addressed in this process. China will work with the DPRK to build a strong relationship for the new era, safeguard the fundamental interests of our peoples, move toward solving the issues on the peninsula by political means, and maintain peace and stability in our region. Press Trust of India: Last year’s India-China summit in Wuhan is widely regarded as a watershed moment between the two countries. What’s your vision for the relationship? Wang Yi: Indeed, 2018 was a year of great significance for China-India relations. The historic meeting between President Xi Jinping and Prime Minister Narendra Modi in Wuhan created a new model of high-level interactions between our two countries. It not just deepened the trust and friendship between our leaders, but also set the direction for our future relations. As ancient civilizations with a combined population of 2.7 billion, major developing countries and neighbors, China and India should be each other’s partner in pursuing our respective dreams and each other’s important opportunity for growing our respective economies. Collectively, we must make our due contribution to Asia’s revitalization and prosperity. Over the past year, government departments on both sides have made considerable progress in following through on the understandings reached by our leaders. The priority now is to see that the strategic understandings of our leaders trickle down to our people and become their common view and conscious efforts. To this end, China will work with India to comprehensively strengthen sectoral cooperation and particularly people-to-people ties, so that our friendship and cooperation will surge ahead like the Yangtze and the Ganges, giving strong and sustained impetus to our relationship. Shenzhen Satellite TV: In the past year the Foreign Ministry’s consular work was more widely known and applauded by the Chinese people. Will there be more good news in this respect in the coming year? Wang Yi: As more and more Chinese travel abroad, people care the most about two things: safety and convenience. Recognizing this, we are putting procedures in place to give outbound Chinese citizens a greater sense of safety and a more smooth travel experience. In the past year, the MFA and its missions around the world processed over 80,000 consular cases, roughly one case every six minutes. The 12308 consular hotline handled 370,000 calls, double the number in 2017. To obtain a passport now, Chinese citizens abroad have to make only one visit to our overseas missions. Consular information and services are available from online platforms including social media accounts, smartphone app and website. The number of countries and regions granting visa-free or visa on arrival entry to Chinese tourists has reached 72, meaning it’s now much more convenient to travel with a Chinese passport. In 2019, the MFA will take new steps to benefit the Chinese people and improve their safety and convenience abroad. First, we will upgrade the 12308 smartphone app to make it a one-stop portal complete with such new functions as making appointments and verifying documents. Second, mobile payment will be phased in by our overseas missions to make more consular services accessible at fingertips. And third, we will speed up legislative efforts to put consular protection and assistance on a sound legal footing and better protect the legitimate rights and interests of our citizens. Lianhe Zaobao: China offered last year to conclude within three years the negotiation on a Code of Conduct in the South China Sea (COC). Will the negotiation pick up pace? How do you address the concern expressed by some people that the negotiation is not transparent enough? Wang Yi: The South China Sea situation has stabilized and improved in recent years. This positive turn of events proves that the dual-track approach is the right way forward, namely the countries directly concerned settle their specific disputes through negotiation while China and ASEAN members work together to uphold regional stability. The COC negotiation is gathering pace under a clear roadmap. China offered the goal of concluding the negotiation by 2021. It shows China’s seriousness and commitment to this endeavor. The COC will be an upgrade of the Declaration on the Conduct of Parties in the South China Sea (DOC). It will be more suited to our region’s needs and more effective in regulating the conduct of the parties. It will provide stronger safeguards for safety and freedom of navigation in the South China Sea and enable China and ASEAN members to build trust, manage disagreements, strengthen cooperation and maintain stability. China and ASEAN members will stay focused, shield the negotiation from interference and try to speed it up on the basis of consensus. We will be as transparent as we can and give updates on the latest progress. The South China Sea situation concerns regional stability. The interest in COC negotiation is quite understandable. We welcome well-intentioned advice, but do not accept deliberate smears or interference. The countries in the region should grasp in our own hands the key to peace and stability in the South China Sea. The COC should be developed and honored by countries in the region. We must live up to this responsibility. Asahi Shimbun: There has been a significant improvement in China-Japan relations, though of course there are still some challenges. People are very much hoping that President Xi will participate in the G20 Osaka Summit in June and visit Japan. What’s your view? Wang Yi: Last year, thanks to our joint efforts, China-Japan relations got back on track and showed positive momentum toward improved and stronger ties. This fully meets the common interests of people in both countries. Our experience shows that whenever Japan adopts an objective and rational view of China’s development and honors the various political principles already reached, the relationship will steer clear of obstacles and interference and enjoy a stable and bright outlook. In the meantime, we can unleash the full potential of our cooperation and create far greater space for it. Of course, we are still in the early stage of improving our relations. Looking ahead, we must match our actions to our words, adopt an honest attitude toward history and an objective view of reality, work actively for a better future, and take more solid and determined steps in the right direction. I’m sure as the two sides work together to cement the political foundation of our relations, deepen mutually beneficial cooperation and foster greater friendship between our people, China-Japan relations will enter a stage of stable development, where we will have more frequent exchanges in various fields and high-level interactions will come about naturally. China News Service: Could you share with us what the MFA did in the past year to facilitate domestic development? And what ideas do you have for this year? Wang Yi: China still being a developing country, facilitating domestic development is an important mission of China’s foreign service. In recent years, we have created three platforms for this purpose. The first is that of high-profile events, which boost the international visibility and development momentum of the host cities. The second is that of the BRI, which supports exchanges and cooperation between Chinese subnational entities and BRI partner countries. The third is that of the presentation of Chinese provinces, through which the MFA helps central and western provinces open up to the world. This year, the MFA will do its best under the direction of the CPC Central Committee to meet the overriding goal of facilitating domestic development. We will make a good job of presenting Chinese provinces under the theme of “China in the New Era and 70 Years of Accomplishments” to help more provinces embrace the world. We will support Chinese cities in hosting flagship international events, which are excellent opportunities to bolster the cities’ development. We will build more “bridges” to encourage Chinese businesses to grow their international presence in an orderly fashion as well as protecting their legitimate interests. And we will organize lecture tours to bring foreign affairs-related knowledge to and share information with Party schools, universities and enterprises.